As most regular readers of Tossing It Out probably know by now, I have an intense interest and curiosity about marketing and promotion and how the whole darn thing works. I like to experiment with marketing ideas and I like to hear about what other people have done. In this post I'd like to address Google Ads. Some of you probably dislike ads on blogs. I may have even lost some past readers because of the ads that appear on my page. Others of you have Google Ads like I do. Or you may be part of an "associate program", sell your own ads, or advertise books or products that you or others are offering. Maybe you get paid for the advertising that appears on your blog or perhaps not. My focus will be on the Google Ads. There is a reason that certain ads show up on the page when you are looking at my blog or another blog that includes Google Ads. I won't go into that here, but I would like for you to scroll down to the bottom of this current post and take note of what the ad is about. Also if you are inclined to do so, scroll down the sidebar and tell me what ad you see right now and you can also scroll to the bottom of the page to see what that ad is. Please tell me in the comments what was being advertised on your screen. For example, as I write this piece, looking at my Tossing It Out page for today I see a cell phone ad from AT&T. In the sidebar there is an ad for a brand of tea. At the bottom of the page is another ad for AT&T. At Wrote By Rote (my memoir blog) there are ads for Dun & Bradstreet, Sports Authority, and See's Candy (mmm--I'm composing this post the day before Valentine's Day). Moving on to my dream blog A Faraway View I see two ads for Dun & Bradstreet and one for an astrology website. For the most part I know why we see some different ads as we look at the same blog page and why we might be seeing the same ads in other cases. Do you know why you are seeing the ads you are seeing? Does the presence of Google Adsense on a blog bother or offend you in any way? Would my blog look better without the ads or would you even notice that they were not there? Are you annoyed by a page that's filled with images of books, badges, widgets, awards, and other images? Would you prefer mostly a page filled with text? Do you even think about such things? Some bloggers choose to have ads - others choose to be adless. Usually I don't mind when reading a blog 'cept for when they intrude and become obvious but then thats the whole idea isn't it! Down at the bottom of your post is an ad for ANZ one of our leasing banks - can't see anything in the side bar that looks like an ad at all. Hi Arlee, no ads here - though I think in the past I've seen an ad or two on a post or two. I pay no attention to ads. Visa ad at the bottom, cell phone ad in sidebar. The ads will vary depending on your location. If there is an ad for a company in your area or state, that's what you will see. I don't do ads, but hopefully my sidebars filled with stuff don't bother people. That's just who I am. I was reading this on my android phone and i only see "Related Articles" links. Each were articles on subjects similar to this. I don't mind ads just so long as they are not pop ups or intrusive into the article itself. Love Jesus, eat cheesecake, listen to Pink Floyd. On-line Marketing symposium in sidebar - had to look twice to notice it! Bank refund ad below for credit card customers. Accidentally closed the tab and reopened it. The ad below changed to one fro hootsuite. There's an ad about a pharmacy. They don't bother me at all.Only ones I don't like is pop ups saying "Your Pc is about to crash, knowing full well they're after your money and credit card details. Cathy --I will check out the WP site thanks to your "ad link" for directing me there. Susan S. -- I usually don't notice unobtrusive ads. Alex -- Location is part of what determines the ads we see, but there are other factors. Like ads, I usually don't pay attention to sidebar stuff unless I'm lingering and that's not often these days. Glen -- I guess phones show different pages than PC's or laptops. Sue's Trifles -- Ads usually change when the page is refreshed, but I haven't paid that much attention usually. Yvonne -- In past I've fallen for the PC ads that look like real messages from the computer. Hate those ads and other ones that pop into the middle of the screen. Those all should be made illegal. I usually read blogs from my iPhone so I don't see the adds. This post intrigues me. I'm never offended by ads. I figure if people have them, they might need the pennies they get from them. Not everyone can give away their product for free. for doing so, I have no problem with that at all. It's not like anyone is getting rich off a couple of ads on their page. I suppose they would need a post or two to go viral for that. And if the post goes viral, it probably has nothing to do with the ads. Say hello to bluebird ad at bottom, download Mac in sidebar. I saw three Ads, the one at the bottom is for Tesco Bank Insurance, The two on the side are one for the Wireless Festival in London (a music thing I think) and for www.zentrenet.com and I dont have a clue what that is. I cant say I have noticed the ads before but some folk have them all over the place which I find a bit off putting. I run an ad free blog and prefer that, I suspect it is not a huge money spinner unless you get hundreds of thousands of page views which I dont. I see ads for Straight Talk and Visa. If you hadn't pointed out the fact that you had ads I wouldn't have seen them. They're very inconspicuous, here. For the most part they're annoying and I avoid them, but I have little against an ad buried in the lower reaches of the sidebar and one planted at the very bottom of the page. I don't have ads, but it doesn't bother me to see other bloggers use them. And I do not see any ads on your blog. But I'm at work so maybe they are being blocked. At the end of the comments sections is 'Intuitive by Design' and at the very bottom is 'Chase' which I would normally never see because it's all the way at the bottom. On the sidebar is the marketing conference and A to Z.
I mostly don't notice ads on your blog. I don't mind ads when they relate to the blog topic or mission (e.g. books on writer's blogs; marketing conference or business on a blog that includes that content like you did here. What I don't like is when ads overwhelm the content or pop up while I'm trying to read something. I expect it on huge blogs with 10K + followers and on commercial sites. For smaller blogs, I want restraint or it makes me feel as if the blogger is only doing it for the ad money and doesn't really care about the content. Here from the A-Z after signing up. First time so a little nervous. Personally not bothered by ads, widgets etc all good. Eye candy. Unrelieved text is boring, and hard to read. Just my two cents. Shelly -- I've never viewed my blog on a phone, but since the screens are so small it would make sense that what you could see would be limited. The main thing is to see my posts. Jess -- I have been concerned lately about my page loading time which is another reason for me to be thinking about the ads on my page. MJ -- Since the payment is the result of number of clicks on ads a viral ad would not make a difference unless a whole lot of visitors clicked on the ads. I've never seen much come in from the presence of my ads but then again I keep them almost hidden or in unobtrusive places. Rob -- The ads you see are definitely according to your locale--pretty amazing in a way. Hundreds of thousands of page views might increase odds, but don't guarantee that the visitors will click on the ads. Patrick -- My aim to be unannoying with ads apparently is okay. Stephen T. -- Blocked? That would be interesting. I've seen a setting that will determine the kinds of ads I can see so maybe there is a block setting. Once when I was with my wife at the Kaiser hospital I noticed that certain websites were blocked. Jagoda -- I think I have used restraint. Pop-up ads are enough to make me avoid a site. Sometimes the ads may be related to the content of the blog post and that might make them less noticeable. For me content comes first. Nilanjana -- I hope my page isn't boring, but I hope it also loads reasonably fast. Welcome to the A to Z. Speaking of marketing strategies, I'm trying something new. I have an ebay ad and a thing from ITT technical institute. The ebay one makes sense. There are three kinds of ads in Chris' world. 1- those that are ignored. 2- those with pretty girls that are looked at while the message is ignored. 3-ads so annoying I write the company and tell them they are annoying. You have a set of #1s right now. The sidebar starts with a "Marketing with postcards" deal", with drop downs for Premium websites, "shocking" 2014 horoscopes, and Best website hosting. The bottom is a AdWords account suspended? ad. If they target me as a visitor, their aim needs improving. Try Adwords Express was on the bottom of the written word. LensCrafters was at the bottom of the page. Only trouble is, who, normally, scrolls down that far, I certainly don't. I am very anti Adsense because they cut me off without any explanation and nothing I could do would generate anything. They owed me $100 at the time too. I scrolled down twice and I don't see any ads either on the side or the bottom. I have not used any ad blocker apps that I know of, so I don't know why I don't see them. I see an ad below for Adobe's Creative Cloud - probably because I featured it in one of my blog posts. Sorry guys, I already use it. All text is really boring. For effective blogging, you need images in the posts and in the sidebars. Interesting questions, personally I saw three ads, one at the end of comments, one lower down from that in the side bar and one right at the bottom...all Brazilian as I'm in Brazil 'clever Google'. The ads didn't bother me at all, most ads don't well except pop ups when they get through! As bloggers we work hard...I often do 14 hours a day...so why shouldn't we be rewarded for our efforts? If we don't promote or advertise things how else can we hope to earn online? Doing surveys? hahah Personally I've added some affiliates to some of my sites, as opposed to ads so I can keep control of what's being advertised, I feel if a product or service is good, why not recommend them. Interesting post. I don't see any ads because I use an adblocker in firefox. If I turn it off there's something called iCross at the bottom (I think they sell digital advertising - somewhat redundant) and Hootsuite Pro (a twitter service) on the side. I see a Comcast business Internet ad, another for the Google play store, and the one at the very bottom of the page for Cabela's. The first ad is from my searching and reading business-related literature constantly (I work for myself), the second one is up there because I own an Android tablet, and the final one is from my many, many searches about outdoor activities I love to do. Google knows entirely too much about me. Considering I work with companies and their content creation, I know how targeted ads and content can be. I would rather see these ads than ones that are completely uninteresting to me, so I'm not annoyed by them in the least. I see a Google Play Ad at the b ottom an ITT Technical Institute in the middle of the right sidebar. That is the only two I noticed today. Andrew --Does ebay make sense because you've been looking things up on ebay? Since Christmas I've been getting a lot of hotel ads, but that's because I was on hotel websites making reservations for our vacation. I'm curious to know what marketing strategy you're trying. CW -- Maybe Google Adsense is playing with you. Jo -- Weird that they would just cut you off. I purposely keep two of my ads way down the page so they don't annoy visitors. JoJo -- Maybe they just didn't load? Or maybe they're so disguised you don't see them as ads. L.Diane --- Images in the text is pretty important although I don't mind all text if it's easily read. Hate big blocks of text. Maggie -- The signature links sure make it easier to find the person who left the comment. I've only had limited experience with an affiliate and nothing came of it, but I didn't do much with it either. I'm signed up with an affiliate company but haven't used it. Mood -- I'd only like to block the pop-up and takeover ads. The other ads that just there I don't mind and even appreciate sometimes. Steven -- You've gotten to one of the points I'm alluding to in this piece. Is Google like the NSA? We have few secrets other than those in the recesses of our minds. Should we be concerned? Paula -- Those ads seem pretty generically computer related. Fascinating topic Lee! I think I am numb to ads now. I only noticed because you asked specifically about them. I see AT&T high speed internet in the middle of the page. I see iPage web hosting on the side and on the bottom I see Daddy & Co. as I recently did an interview with the founder. 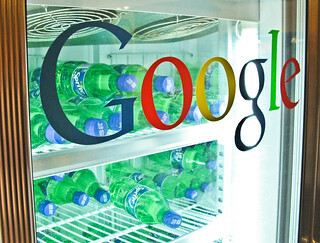 Would you take a job with Google Ad Words if they came a calling? Would that be a dream job? I use ebay from time to time. Selling cards, mostly. Check my post from Tuesday for my new thing. Buck -- I wouldn't mind being offered a job with Google, but it would probably be a longer commute than I'd like. Now if I could work at home for them that would be cool. Interesting that you would see the Daddy & Co. ad, but it totally makes sense since you probably visited their web page a number of times. Andrew -- I will be there. I usually try to make it to all your posts but I often arrive late. I don't see any because I have them all blocked. But similar to most everyone else, I don't mind ads as long as they don't intrude on my ability to experience what I've come to read or see. One from National Geographic and one (way down) for Safeway (chain grocery.) I generally ignore them. I don't see any ads. But in general they don't bother me. Hopefully you are getting enough hits on your ads to make a little spare change. In my mind, if folks have good content on their blogs, and I can read them easily, then it makes no matter to me how they choose to dress things up or advertise. It's their blog, after all. For the most part though, I don't click. I don't see any ads. I ignore them. I see an ad for Large Photo Prints (I think). It isn't attractive, but I am pretty sure it is an ad. It has a web address you can click on... www.Igphotoprints. The ads on the bottom of your site both are trying to generate more ads. Go figure. One ad is for a printer and the other is for Photoshop. I know why, it's because I searched for information about Photoshop a few days ago. I am part of an associate program on my writing blog but I never gave them my bank account info so I don't get paid. (Trust issues, much?) I just wanted to share some of my favorite books with others. I don't have a problem with ads as long as they are popping up and preventing me from reading the blog. AJ -- When a blogger has something to market of their own then those ads understandably take precedence. homecoming -- Those are interesting ads that I've never seen on my screen. Liza -- Content is the main thing for me too. And I rarely click on ads either, but I have on occasion and to the benefit of the blogger on whose site I saw the ad. Bish -- For me it's kind of like television. I tend to ignore the ads and often switch to other channels to watch something else while the ads are playing. Sometimes I watch two shows at once. Robin -- Most of my sidebar is filled with links to other blogs. I've thought about cleaning some up, but I'm reluctant to remove any of them. A year or two ago I did remove most of my awards and badges which cleaned things up immensely. Elsie -- If someone wants to find out about any of us or get more privileged information, they can find it eventually if they go through the right channels and pay the price. I've conceded my privacy for convenience in many cases since we really don't have that much privacy. Normally I initially read this blog and others on my phone. As others have stated the mobile app is very abbreviated and does not show ads. I do need to come to the computer to comment, and that is when I will notice the ads. I really don't mind bloggers trying to make a little extra by linking to ads or using adsense. WHAT I DON'T LIKE is how the ads are customized to things I may have been researching recently. THIS confirms that I am being spied upon and a log kept of my recent research. No matter how innocent the purpose may seem (that would be if you consider advertising, marketing, and messaging innocent), kind of like stealing, spying on my private research is still spying. I suppose what we have to remember is that being ONLINE is NOT PRIVATE. Faraway-- Your comment addresses the crux of my concern or thoughts about online activity. But even if we are never online, are we really hiding anything? Maybe from some friends and neighbors who aren't snooping in depth, but there is info out there about each of us that is available to those who are intent on accessing it. The government can dig up anything they want on each of us. I have another post on these issues coming up soon. I agree with you completely, BUT keep in mind most the information that can be dug up on anyone is mainly information that they have freely given to someone, at some point in time. It may be best to hide in plain site and keep your mouth shut. I retread that comment and realized that should be 'in plain sight', AND don't you just love it when someone says; 'I agree completely, BUT'. Sorry about that, ha, ha, ha! Faraway -- More fuel for my upcoming post about this. Honestly, I've never noticed the ads on this site. Personally, I think the sidebar one is way too low. I almost couldn't find it. I'm 50/50 about ads. It depends. Authors selling me books - should not have ads. In general, sites should use no more than three ads. No blinking ads or flash ads! I don't care for sidebars loaded with widgets and awards. It becomes overwhelming and I block it all out. sidebar: crazy egg - no risk 30 day trial! Where my SEES CANDY AD! Pish posh that it's after Valentine's Day. Southpaw -- I agree that authors selling books or anyone selling anything of their own should not use ads from other sources. Since I'm not selling anything yet then I get a pass. Thank you for checking all my sites. You must have something going about Bluehost to have those ads appearing so much. Do you have See's Candy outlets where you live? It may be a regional thing. I host my site on bluehost. See's is regional. They don't sell in New England. There are a couple of places that sell a small selection, and sometimes at Christmas they have stands. But they sell online to anywhere! See's is the best! Southpaw -- So the Bluehost ads for you make total sense. See's Candy is really really good. The best? For some things maybe. Then maybe other chocolates are equal or better for things like the truffles. Godiva can be very good. But I'll never complain if I receive a gift of See's Chocolates. Mmmm! I'm craving some right now. Since I already use bluehost, it seems like wasted advertising to me. But more importantly, let's discuss chocolate. Godiva is ok, but Lindt is better, still See's top them all. It has to do with the quality of the actually chocolate I think. Sadly, where I live now there are two popular brands - I will not even mention - that taste like chalk. Southpaw -- I guess the driver for Adsense doesn't know what you have, but only knows that you access it so it sends you the advertisement. Or maybe it's a constant reminder so you stay loyal. I think I would need all of the chocolate brands side by side to do accurate taste testing and not rely on memory. And they do have special features I think that make certain kinds better than others in their realm of specialty. I've had Lindt, but not a lot of experience with it and I think only plain or flavored chocolate bars. I actually enjoy Whitman which is the one I had most often when I was growing up. Right now we have a box of Russell Stover in our cabinet. I'll have to break that open to test it, but I remember it being good. There are not many chocolates that I've found despicable other than maybe some cheap Chinese chocolates that my wife's students have gifted her with on occasion. I just don't associate China with good chocolate, but I guess they're working on it. I'm sure I'll be having some kind of chocolate later today. Lately I've been eating a Rocky Road candy bar every day because they were on sale at the market where I shop. That's probably my favorite candy bar of all. I actually have no problems with ads, so long as they don't overwhelm the blog. I don't really pay attention to them either. However, if the amount of ads makes it extremely difficult to read a blog, I will stop visiting the blog. Right now, I see an ad for the Perth Mint. My best friend collects coins so, it makes sense. A few ads don't bother me but I've seen places with more commercials than content. That bugs me. I have a Rogers ad at the bottom of my mobile screen. Ads don't bother me, so long as they aren't intrusive. The ones that pop up are extremely frustrating. GB-- I've visited some sites where it's difficult to distinguish the ads from the content. Actually the content is usually one big ad. Jennifer-- As I said in my previous reply. Carrie-Anne -- Don't know why people allow pop-up ads on their sites. In the sidebar - Blurb; at the bottom of the post, RSPB (UK Audubon equivalent), at the far bottom, British Airways. Blurb makes sense as they are sponsoring an event I'm going to tomorrow. RSPB comes up most places I go. First time for BA. I know it's to do with cookies or the follow settings deep in the privacy settings of one's browser - I've set those to not allowing something (as advised somewhere else). I'm lazy about cookies though. I don't like not having control over the ads - I took it as far to move my blogs onto an ad-free platform at the end of last year - but lost all my email follwoers in the process. It's a hard job building them back up. The ads always *seem* to be appropriate, though.